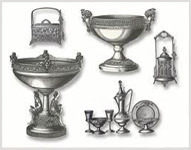 The Silver Plating process gives mirror bright and hard silver plating with anti-tarnish effects. Besides, it is mainly used for electrical (switch gear) & electronic components that are generally exposed to high humidity environment. plating with anti tarnish effect. Mainly used for electrical (Switch Gear) and electronic components. Used in artificial/real Jewellery.